Steve On Broadway (SOB): Cloris To Mel: Put Up Your Dukes! Cloris To Mel: Put Up Your Dukes! Fascinating story in this morning's New York Post "Page Six" column in which actress Cloris Leachman is challenging Mel Brooks "to three rounds in the ring, and we'll see who's left standing" -- a dare delivered by the acclaimed actress' representative Steve Rohr. Apparently, the woman who created the celebrated character of Frau Brucher in Brooks' film "Young Frankenstein" was notified by snail mail that she would not be invited to recreate the role on the Great White Way. The stage musical adaptation is now scheduled to open this November at the Hilton Theatre. While the official word is that Brooks wishes to start fresh by having "the stage version to differ from the film version," "insiders" are quoted saying the real reason is because the 81 years young actress is "too old." Indeed, Brooks -- who is barely two months younger than Leachman -- told Variety's vaunted columnist Army Archerd (himself 85), "We don't want her to die on stage." As duly noted in the "Page Six" column, that's actually the way most actors would prefer to go. Although Leachman had participated in last year's initial reading of Young Frankenstein, veteran actress Andrea Martin has since been cast in the role that strikes terror in neighing horses (although, curiously, she's not yet listed among the show's cast members on the Internet Broadway Database). The show is scheduled to begin its out of town tryout in Seattle in early August at the city's Paramount Theatre. Personally, I adore Andrea Martin and relish every opportunity I have to see her perform live. But I've always been struck by the eternal Dorian Gray youthfulness of Leachman and was downright thrilled by the prospect of seeing her reprise her legendary film role on stage. I can't help but wish Brooks, Susan Strohman and company would reconsider. Click here for Young Frankenstein tickets (Seattle). Post Script: No official word on whether Mel Brooks has accepted Cloris Leachman's challenge to duke it out, but official word came on 6/19 that Andrea Martin would indeed portray Frau Brucher in Young Frankenstein. I have no doubt that Martin will be fantastic - she's been incredible in everything I've see her in, whether it was the underappreciated My Favorite Year or the riveting, vital Off-Broadway production of The Exonerated. 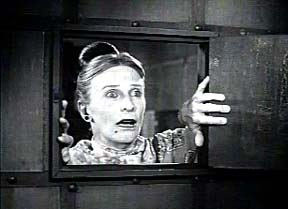 I just would have liked to have seen Cloris Leachman recreate that scene-stealing role live on stage. As noted earlier, I will be taking in the Seattle tryout in about two months. You can be sure I'll weigh in after seeing it.